High-performance, non-reactive, hard anodized aluminum construction provides exceptional efficiency and uniformity. 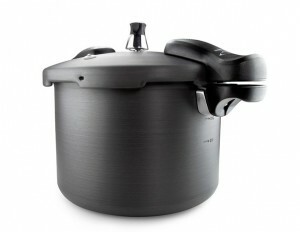 Lighter, more compact design makes pressure cooker easier to store and carry. Instructions and recipes included. Triple safety system locks lid until all pressure has dissipated. Independent release valves prevent over-pressurization, even if one valve becomes clogged. Reduces cooking time by up to 66% saving fuel, effort and carbon emissions. Pressure cookers… They are good, they are bad, but they are not all ugly. Today we’ll be looking at the beautiful anodized Halulite 5.7 liter pressure cooker from GSI Outdoors, and when we are done we’ll cook up a hearty Guinness stew to give this thing a little test drive. GSI’s pressure cookers are constructed from a proprietary ultralight non-reactive aluminum alloy called Halulite which is the foundation of its exceptional strength and durabilty. The base is specially designed to improve heat distribution, providing superior efficiency and uniformity. The Halulite pressure cookers feature an attractive brushed finish that is a fully encapsulating hard anodized shell that provides a rugged garnet-like surface for exceptional scratch, abrasion resistance, easy cleaning, and to keep food away from the aluminum. Anodization is more durable as it is a treatment, and not a coating like non-sticks. Halulite’s biggest claim to fame is that it conducts heat better and more evenly than Titanium cookware as noted on GSI’s Halulite webpage. Well… That is a difficult one for me to validate here. Especially in a simple product review like this one. However, I can attest to the fact that the pot heats rapidly and it is distributed evenly each time that I cooked with it. Essentially a heavy-duty pot with an airtight lid, Halulite pressure cookers operate at a working pressure of 11.6 PSI. To keep things safe, Halulite pressure cookers feature a triple safety system. The lid locks itself down until all pressure has safely dissipated. Independent release valves prevent over-pressurization, even if one valve becomes clogged. Cooking under pressure can reduce cooking time by as much as 66% saving fuel, time and of course carbon emissions. To function, the pressure cooker require a small amount of liquid, but watch the maximum food and maximum fill lines. Typically 1-2 cups is enough depending on the recipe. Water, stock and even beer or wine can be used. Once the lid has been securely fastened and the liquid in the pot begins to boil, the steam is unable to escape. As a result, the pot pressurizes causing the internal temperature to rise well above the normal boiling temperature. The combination of high heat, liquid and steam will cook food much more rapidly, greatly reducing the cook time. Even boiling water occurs much faster. Soups, stews, vegetables, grains, dried beans and even rice prepared in a pressure cooker are often more nutritious and flavorful. Cooking under pressure preserves many of the water-soluble spices, vitamins and minerals that are typically lost as a result of traditional cooking methods. Without the lid, the pressure cooker can be used just like a normal pot for sauteing, boiling or slow cooking. With the lid but without pressure, the pot becomes an efficient steamer for breads, dumplings and fruit puddings. Aside from being a little small for canning, the Halulite pressure cookers should work just fine provided you follow the directions closely. However, it is important to note that the pressure is fixed at 11.6 pounds, and it is not adjustable. The Halulite pressure cookers come with a detailed instruction manual and a few recipes to get you started. Pressure cookers can be very dangerous if not used properly so it is very important to read the manual thoroughly before you get started. One not so obvious use of a pressure cooker… With a length of 3/8″ or 1/2″ tubing, one of these pressure cookers could even be used as a desalinator. Simply remove the weight and attach the tube in its place to catch the steam. As the steam cools, it will turn back into pure distilled water. As I was reviewing the pressure cooker I attempted two different beef stews, and on both attempts I thought that I could just wing it… However, even though the meals were edible, the results were far from good, and likely worse than that. I learned the hard way that some ingredients just do not go well together. With each attempt the pressure cooker performed flawlessly. The bottom of the pot heats evenly allowing the meat, potatoes and seasonings to saute and brown quickly without sticking to the sides or the bottom. Once the lid has been locked down, the pressure in the cooker quickly rises and the weight begins to dance away. If the weight dances too aggressively, it may fall to one side relieving the pressure. If this happens, simply reset the weight and turn the heat down a little so that it is just barely jiggling. Once the desired cook time has been reached and the heat removed, the pot will begin to cool and depressurize. If you need it to cool and depressurize quickly, you can simply run cool water over the pressure cooker to get it cooled. It is very important not to open the lid until all of the pressure has been released. I completely remove the weight before I try to open the lid myself. Additionally, while I’m opening the lid, I tilt the lid away from myself so I don’t get a facial in the process. Another positive note, after each stew had been put into another container, I found the pot very easy to clean. A little soap and water with and it cleaned right up. I think that following a good recipe will be the key to a successful meal so my next attempt will be the recipe below and this time I will follow it to the letter and circle back with the results. Remove the bones and excess fat from the lamb and cut into 1-inch cubes. Chop the celery and carrots into 1/2-inch cubes. Brown the lamb and potatoes with the minced garlic, seasonings and butter in the pot. Add the remaining vegetables, garlic clove, barley, broth and Guinness to the pot. Make sure the levels are below maximum fill lines. Lock down the lid and bring to a boil. Cook for 15 minutes at full pressure. Remove from heat and let cool, relieving the pressure. Once the pot has been completely unpressurized, open the lid. Stir, further season to taste and serve. GSI’s Halulite pressure cookers are efficient and perfect for outdoor adventures and many survival situations. They are extremely lightweight and constructed from quality materials that heat fast, evenly, and are easy to clean, pack and stow. The substantial reduction in cook time and fuel consumption greatly increase their value. For this review, I only had the opportunity to try out the 5.7 liter model. For a family campsite, RV or if you find yourself bugging-in, the larger model is sized perfectly, but I would love to get my hands on their compact 2.7 liter pressure cooker someday to use when I’m out and about in the bush. At a little less than $60, the value that they can provide far exceeds their cost for most. If you’ve ever cooked with a pressure cooker, you would likely agree. If not, they are definitely worth a try.